A short video clip of Bernard Katz and his glass blowing team working on a custom glass sculpture. The video clip below shows the glass blowing team necking glass during the blowing process. 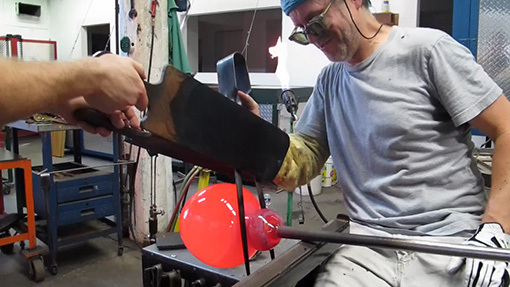 Using a glass blowing tool called “jacks”, Bernard is creating a “neck line” in the glass sculpture. This is important because when the piece is eventually transferred to the punti from the blow pipe, this creates a break point in the glass piece. If this were a traditional vase, the break point would become the top of the vase or opening. In the video you can hear a little “shop” talk going on while the team is working. Many times we talk about the work at hand, but sometimes there is just small talk that has little to do with glass.